We use the latest AGFA CR 35-X digitizer and the AGFA Drystar AXYS imager, one of the best available computed radiography systems from Agfa Healthcare. 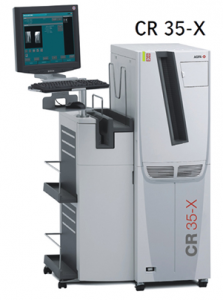 The CR 35-X is a highly versatile digitizing system which supports a broad range of applications and gives an excellent image quality. The DRYSTAR AXYS is the only tabletop imager on the market able to print mammography images, it meets demanding image quality requirements, such as mammography and rheumatology, with ease. The imager incorporates Agfa HealthCare’s Direct Digital Imaging (DDI) technology, which provides virtually flawless and consistently sharper image quality. DRYSTAR AXYS offers a new “axis” for digital radiography workflows, including support for mammography imaging among a wide range of applications. Enjoy the benefits of our increased productivity thanks to the ultra-short access time and the efficient throughput; the first prints are now available in an instant.